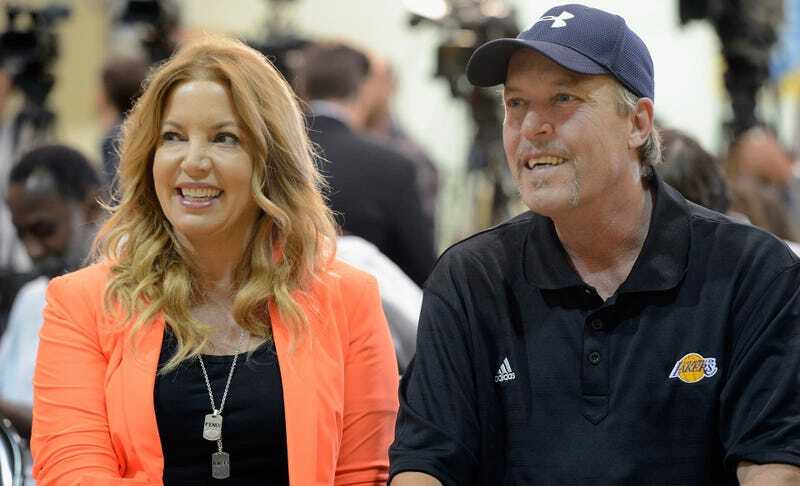 Jim and Johnny Buss attempted to remove their sister, Jeanie Buss, from her role as Los Angeles Lakers president and controlling owner, reports the Los Angeles Times. According to the Times, the brothers sought to hold an emergency meeting to elect a new board of directors for the Lakers next week. After Jeanie’s lawyer, Adam Streisand—who represented Steve Ballmer during his purchase of the Clippers and navigated the messy Sterling family trust—filed for a temporary restraining order, the brothers withdrew their request. After longtime Lakers owner Jerry Buss died in 2013, his 66 percent ownership interest in the Lakers passed on to the Buss family trust, which is equally controlled by his six children. According to Jeanie’s lawyers, according to the trust she is the team’s controlling owner, and the controlling owner must sit on the board. The family trust elects three of the five members of the board of directors. Jeanie—who was the team’s alternate governor under her father, and has been the governor since his death—relieved Jim of his executive vice president of basketball operations role last week, turning basketball operations over to Lakers legend Magic Johnson.